I don’t want to say much about Namur, but as capital of Wallonia (the French-speaking half of Belgium) since 1986 it might one day be capital of an independent state! It’s still a fairly small town and not that attractive, but it’s dominated by the citadel that’s set high on the hill between the Meuse and Sambre rivers, which is an unmissable detour (as the Michelin guide might say). It has been under refurbishment since 2012, but the museum at the Visitor Centre in the Terra Nova barracks block gives an excellent overview of the linked history of the town and citadel ever since they were a mangrove swamp more or less on the equator 340 million years ago. A small Roman settlement developed into a trading settlement which was increasingly prosperous from the tenth century until the local count was forced to sell it to Burgundy in 1421. The town, ruled by Spain then Austria, lost much of its importance, even while its citadel became a major strategic point – its fortifications were built up in the 15th and 16th centuries, then the Terra Nova sector was added in 1631-75, followed by the Fort d’Orange in 1690-1, trying to secure the citadel’s one weak point, along the ridge between the rivers. Even so, the citadel was captured by the French in 1692, and Louis XIV’s great military engineer Vauban improved its defences, adding lots of tunnels which are a major tourist attraction today. It reminded me of Luxembourg, where there are 23km of casemates to be visited. 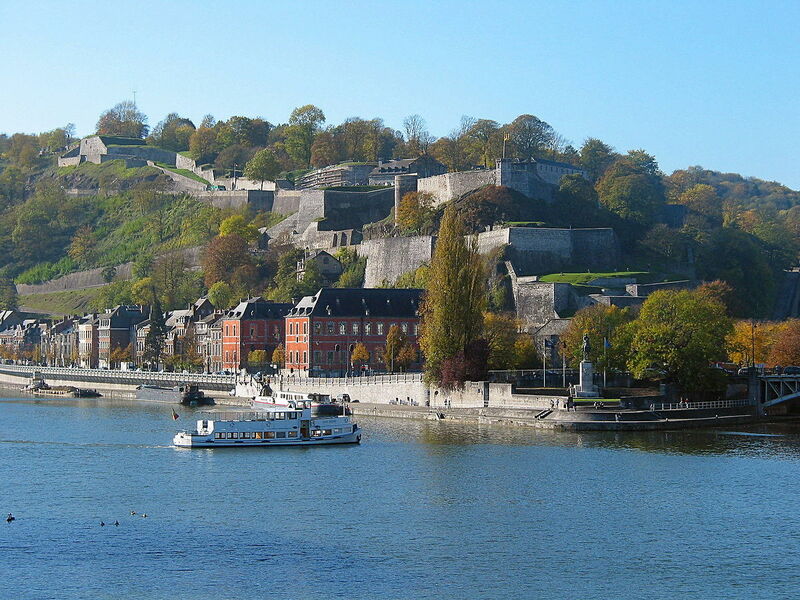 Namur citadel, beyond the Parlement de Wallonie (red) – there’s now a foot/cycle bridge across the river in the foreground. In 1696 it was recaptured by the forces of the Grand Alliance; until 1792 the town was Austrian but a treaty gave the Netherlands the right to hold various fortifications towards the French border. After the French Revolution Namur became part of Napoleon’s empire, then part of the Netherlands and then, after its secession in 1830, Belgium. Incidentally, Marshal Blucher came through with his Prussian army on the way to Waterloo (which is just south of Brussels, of course) and a few days later Marshal de Grouchy came through in the opposite direction, trying to reach safety after the French defeat. The citadel was gradually demilitarised (but a ring of nine concrete forts was built around the city in 1888) and a road known as the Route Merveilleuse was built up to the citadel in 1904 – trams made it all the way up, now replaced by buses, and from 1957 to 1997 there was a small cable car too. There’s an open-air theatre, various restaurants and an amusement park, but the main attraction is the view. 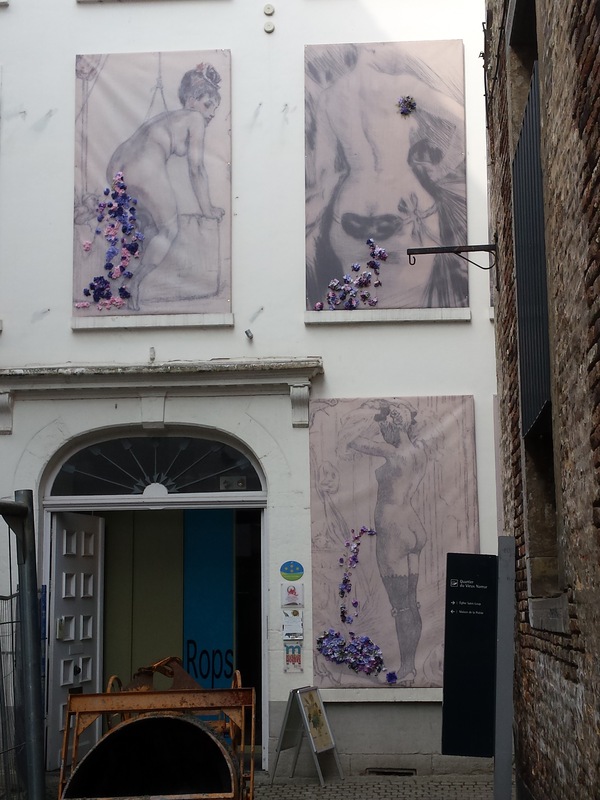 The other thing to catch my attention was the Musée Félicien Rops, dedicated to the Namur-born decadent artist who was a great friend of Baudelaire and produced illustrations for books by him and the symbolist poets who came later, such as Mallarmé, Verlaine and Barbey d’Aurevilly. He struck me as similar to Toulouse-Lautrec, in that he didn’t leave a great legacy of traditional paintings but just by producing posters and engravings established a reputation that survives (to a lesser extent) to this day. He was particularly good at caricatures and at depicting women (not only naked ones, although many of them were). He had a suitably decadent life himself, loving two Parisian sisters and having a child by each. The museum has well-presented displays that make a good case for him without overstating his importance. You’re also likely to hear of the Treasure of Oignies, wonderful thirteenth-century goldsmithery (with particularly good filigree work that reminds me of Georgia) from the priory of Oignies near Charleroi, now the pride of Namur’s Museum of Ancient Arts (known as TreM.a), housed in an attractive eighteenth-century townhouse. Other exhibits include fine Mosan enamels (as mentioned in my first post on Liège) and an unusual but attractive panel of Christ Awaiting Death, painted in the sixteenth century. 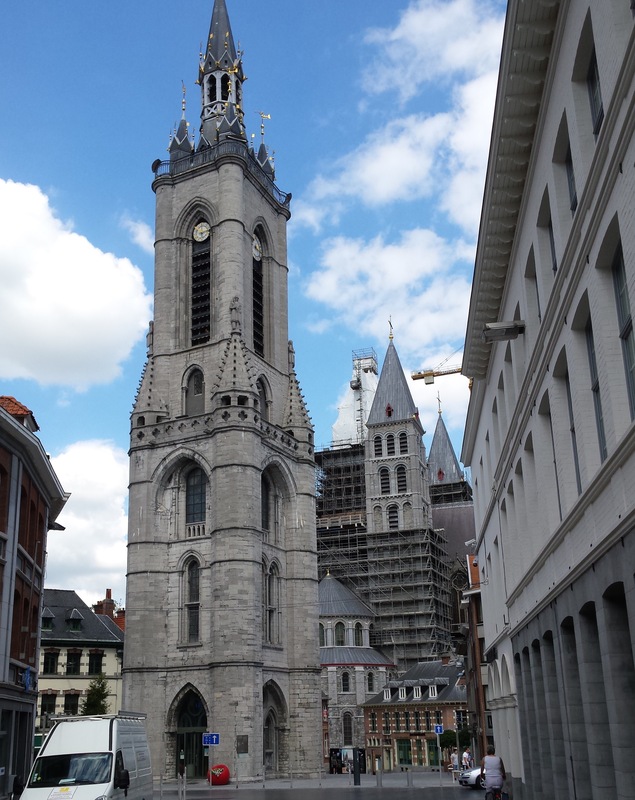 The Tour Saint-Jacques, constructed in 1388, became a belfry in 1746 and is on the World Heritage List – see my post on Tournai. On the beer front, Namur is known for Blanche de Namur, from the Brasserie du Bocq, a wheat beer that is good but somehow failed to thrill me, and La Houppe, from the Brasserie de l’Echasse, a coppery-blond beer that I found lovely, with citrus notes and a fine balance of three different hops – it’s dry-hopped, with the third set of hops added during secondary fermentation, and given a long period to mature, allowing it to be unfiltered. 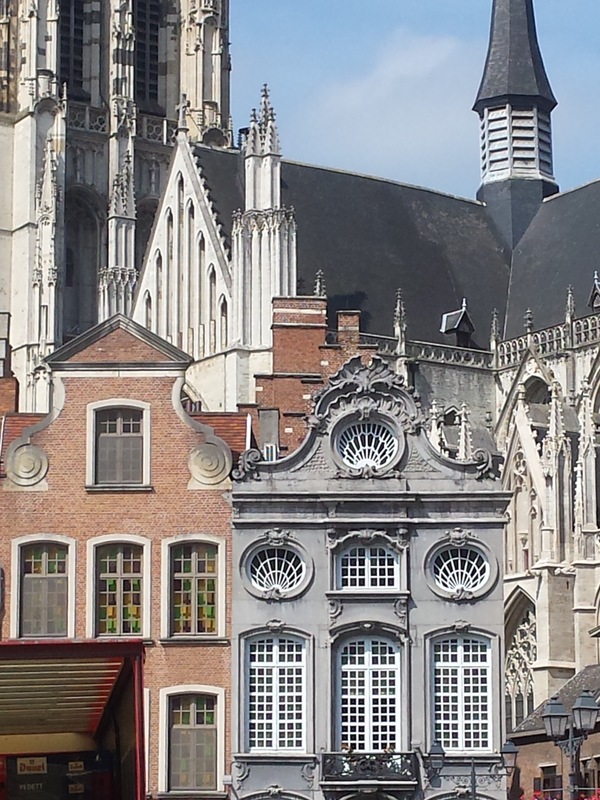 I didn’t plan to write about Tournai but it’s definitely worth a few paragraphs, especially as it’s so easy to get to – it’s in Belgium, of course, but under half an hour from Lille, which is just an hour and a half from London by Eurostar (and can also be reached by TGV and Thalys trains from all over western Europe). The small Roman town of Tornacum later became the capital of Clovis, founder of the Merovingian dynasty and thus of what is now France – and so Tournai claims to be the oldest city in Belgium. Ruled by its bishops, it became very prosperous in the twelfth and thirteenth centuries, but was then fought over by many countries, being ruled by the English, Spanish and Austrians at various times. It suffered terribly in the world wars but is now part of a prosperous cross-border metropolis centred on Lille. Its main landmark is the cathedral of Notre-Dame, which is a very odd-looking building, with a central tower above the crossing and four taller towers clustered around it in the four angles of the transepts – they’re all different, clearly showing the transition from the Romanesque style to Gothic. If the nave and chancel didn’t exist the transepts, 67 metres in length, would still form a large church (though 90 degrees out of line, of course). The current building was begun around 1140, but work began in the next century to make it bigger and full of light, along the lines of the new Gothic cathedrals in the Île de France, requiring huge flying buttresses. Interestingly, it was also the model for the church of Our Lady in Brugge (Bruges), where I was the next day. The cathedral was badly damaged by a tornado, of all things, in 1999 and is now undergoing major refurbishment; scaffolding was erected in the transept in 2013, supposedly for a period of five years, but it looks as if it’ll be there for a bit longer, with plenty more outside. There are other churches that are worth visiting, such as St-Quentin and St-Jacques. Just north of the cathedral is a very solid belfry, one of 55 across northern France and Belgium that are inscribed as a group on UNESCO’s World Heritage List (as – separately – is the Notre-Dame cathedral) – built between the eleventh and seventeenth centuries, they’re important as symbols of civic power, a third pole between the church and the lord’s castle. 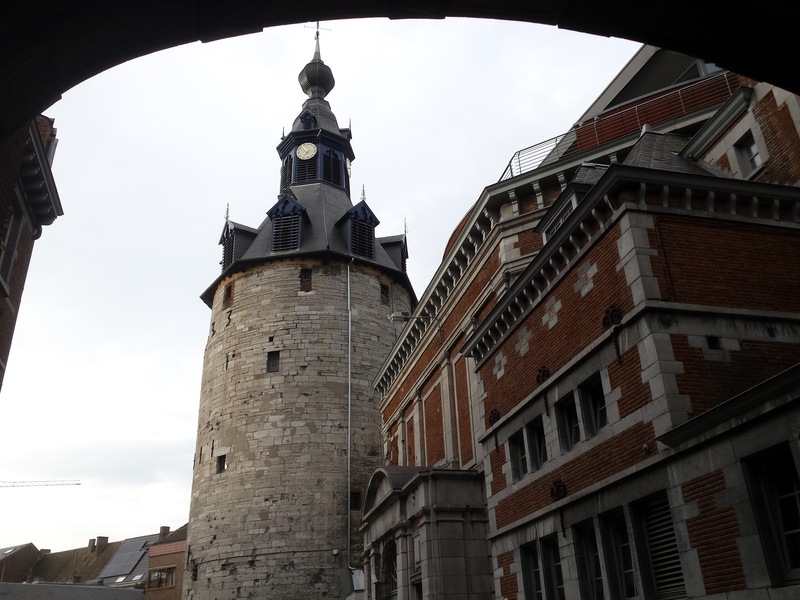 This one, built in 1188 and raised and strengthened in 1294, is the oldest in Belgium. I’d seen the one in Amiens, with a twelfth century base and an eighteenth-century top, the previous day (as well as the modernist Tour Perret by the railway station), and in the next couple of days I was to see the Belforts in Brugge and Gent (both high, and reminiscent of the campaniles in Florence and Siena), as well as in Namur, Mons (the only Baroque belfry in Belgium), and the Deco one in Charleroi (1936; also on the World Heritage List). And a week later in Dinan, I saw their fifteenth-century horloge, which played a similar rôle as the town’s third pole of power (there are just three left in Brittany, in Dinan, Fougeres and Concarneau). I’m really not sure that the group of 55 belfries hang together as a group, but it makes more sense in conjunction with UNESCO’s listing of Belgium’s carillon culture on its register of intangible cultural heritage in 2014 – time and again, in Belgium and in to a certain extent in the Netherlands, one hears bells playing a pretty simple tune that people seem to think is a significant expression of their culture. Personally, I was more impressed by the number of people playing pianos in stations and elsewhere – yes, public pianos are quite common elsewhere, but they seem particularly well used here, and the standard is pretty high too. In 2016 UNESCO added Belgium’s beer culture to the register of intangible cultural heritage, which seems far more worthwhile to me. 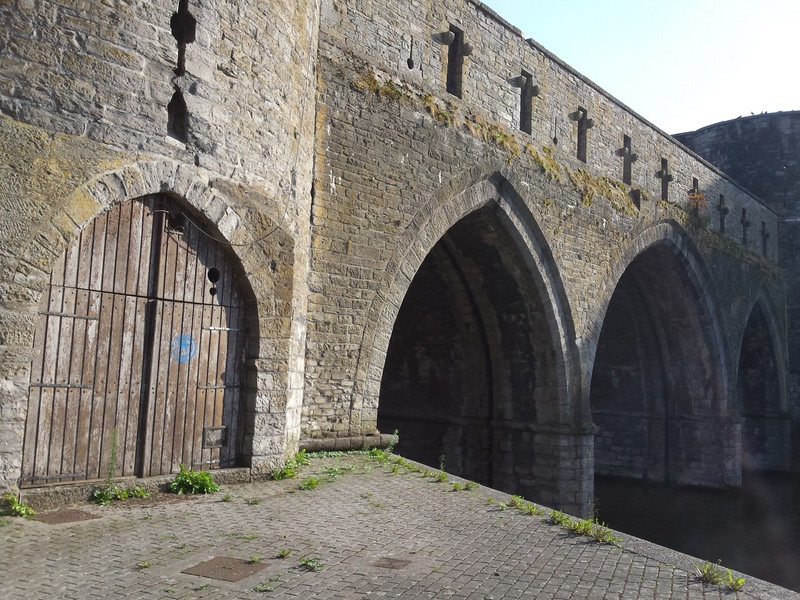 The medieval walls included the Pont des Trous, built across the Scheldt in about 1329 – the central arch was destroyed in 1940 and rebuilt after the war with a wider span to allow the many big barges to pass more easily. 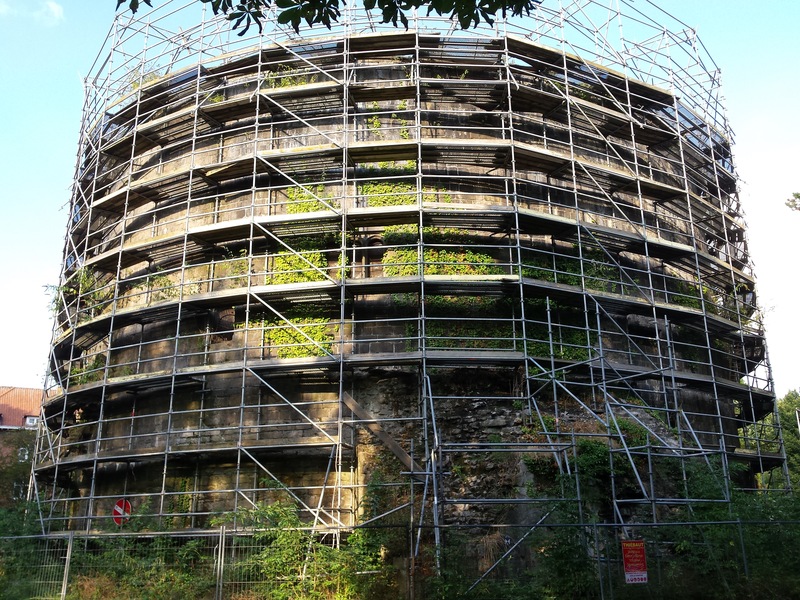 Not far north is a circular tower built for Henry VIII (yes, Tournai was held by the English from 1513 to 1519), which is currently covered in scaffolding but did remind me of his castles at Pendennis and St Mawes. I was also struck by the grim three- and four-storey Romanesque houses, built at the end of the twelfth century, in the St Brice quarter. On the art front, Tournai was the birthplace, in 1399 or 1400, of one of my favourite artists, Rogier van der Weyden – there’s a lovely Virgin and Child by him (well, the child is less lovely) in the Musée des Beaux Arts, as well as a Holy Family by one of his followers or students. The display standards are not great, but the museum does also have works by Pieter Brueghel father and son, Jordaens, van Goyen and Mabuse, and from the nineteenth century Courbet, Manet, Monet, Alfred Stevens (Belgian, by the way) and a poor Seurat; there’s also an ink drawing by van Gogh and a couple of Toulouse-Lautrec sketches. Speaking of Belgians, there are also some nice pieces by Guillaume van Strydonck (1861-1937) and Félicien Rops (1833-98) and a dozen by James Ensor (1860-1949) – not especially weird by his standards, and so not actually that interesting. He’s really not one of my favourite artists, but I do quite enjoy Rops, especially after visiting the Musée Rops in Namur a week or two later. 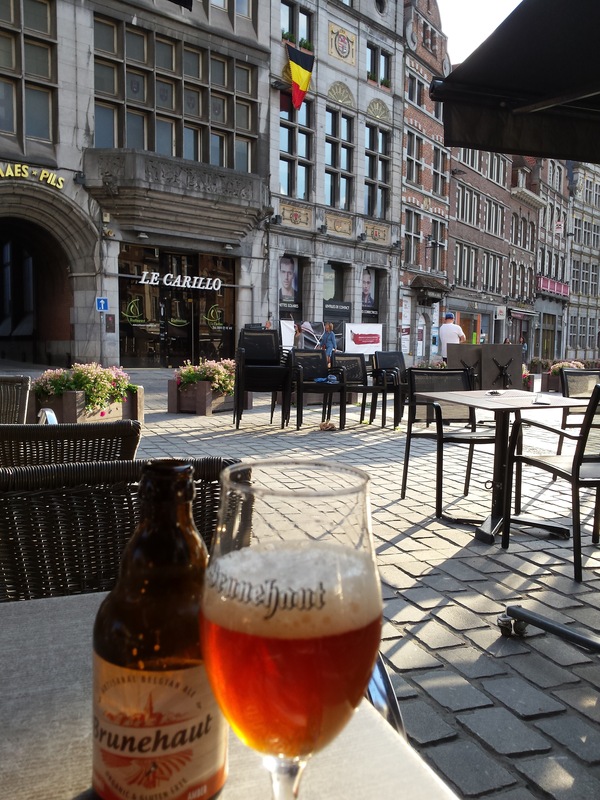 I stayed in the excellent HI hostel, right next to the art museum; and I greatly enjoyed the first of quite a few Belgian beers that I was to sample over the next week – see my previous post. This was an amber beer from the St Martin abbey brewery, now known as Brunehaut, and as the first it lingered in my mind as a special experience. 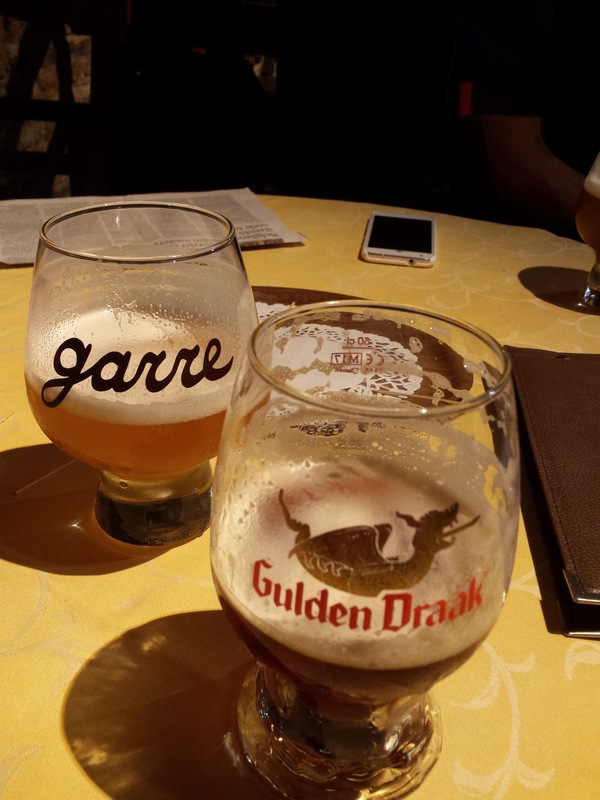 Other great beers are available locally, such as Cazeau, Dubuisson and Dupont, and to show that I’m not obsessive I also very much enjoyed the Eva Cosy tearooms and Un Thé Sous Le Figuier, an unpretentious little restaurant. I’d like to linger a little longer next time! (but that’s a good start, say Rob and Nigel). 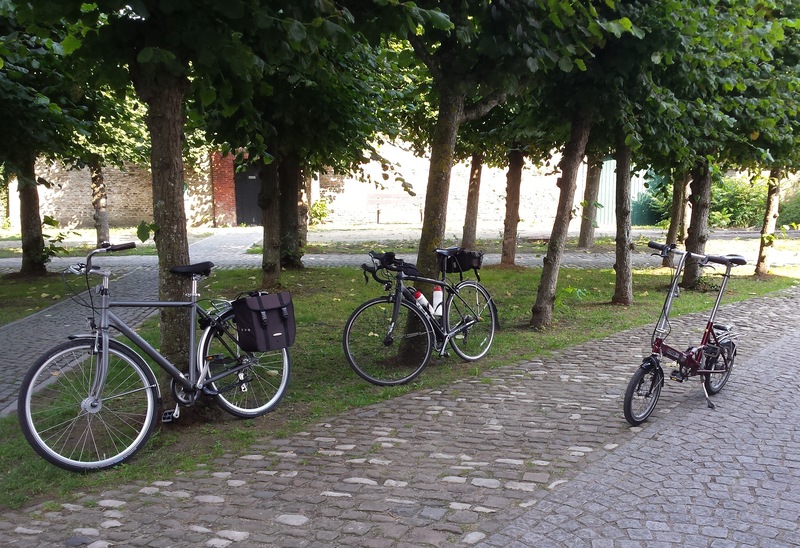 We were an odd trio of cyclists, me on a fairly heavy town bike rented in Bruges, Rob (who’s previously featured in accounts of cycling in Taiwan and Yorkshire) on his folder and Nigel on a carbon-fibre Audax bike that he’d have liked to sleep with at night, but it worked very well – partly because the infrastructure is so good and there’s a positive Dutch-style cycling culture. This meant that even where the cycle tracks weren’t perfect we could still feel safe and keep rolling along because we were confident that drivers would give way, in a way that they certainly wouldn’t in the UK. The infrastructure felt like a slightly cheaper version of the Dutch gold standard, ie even the best segregated tracks were only three metres wide, not enough for cyclists to overtake in each direction simultaneously. Watch out for the Omleiding signs – if they say that a cycle route is closed for construction and you should follow a diversion, just do it – there really won’t be a way for cyclists to sneak past. Renting a bike worked fine for a trip involving 50-60km a day at most, and that largely along wide canal towpaths and the like. It was a sit-up-and-beg (or sit-up-and-look-around) bike with seven gears that I called my momentum machine – pretty good in a straight line but not particularly manoeuvrable (similar to the Vélib bikes I rode in Paris a few days later); it was better on the all-too-common cobbles than the folder, but still not comfortable. Apparently (according to an article Rob once wrote), Dutch-style sit-up-and-beg bikes are great for women for certain anatomical reasons, but I don’t know why men would bother with them. There’s no denying the women look great, though, as they sail past with legs fully extended. My bike didn’t feel as if it had a long-distance saddle (or maybe I just don’t have a long-distance bottom), but I’d be happy to rent one for a week again – you should bring your own panniers, as in Taiwan (probably a good rule anywhere), and a U-lock. 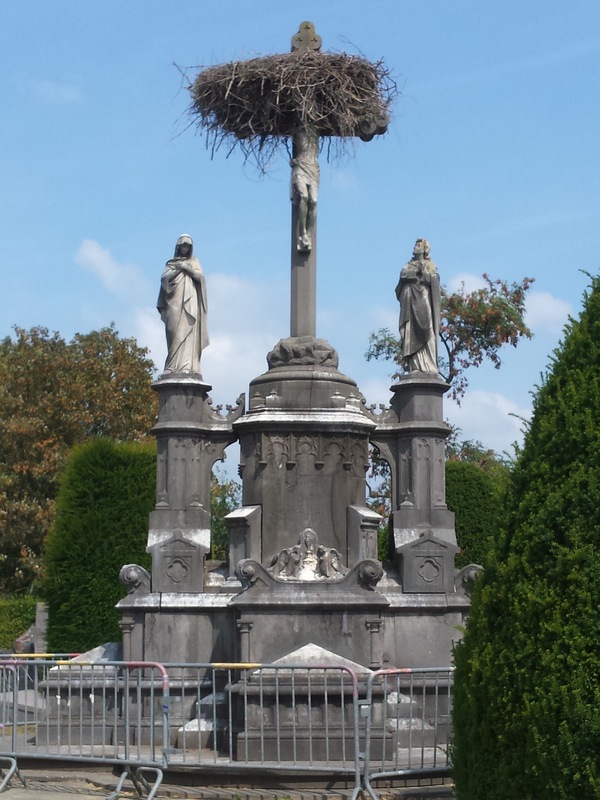 We went from Brugge (the local name for Bruges…) to Gent (the local name for Ghent or Gand), Antwerp, Mechelen and Leuven, over three easy days of cycling, and it was delightful, following canals and railway lines, with windmills, grebes and storks, lots of grannies on e-bikes whizzing past us and other elderly couples pottering along slowly on their elderly bikes. The excellent new routes alongside the railways to the southwest and south of Antwerp are branded Fietsostrada, as in autostrada (F4 and F1 respectively) – in Britain we might call it a Bikebahn. There wasn’t much time for museums and art, so I filled in a few gaps when I returned my bike (by train – €5 for a bike ticket) to Brugge. Luckily there was plenty of time for beer, with the odd lunchtime/afternoon refresher, and more detailed research in the evenings. Everything you’ve heard about Belgian beer is (probably) true – there’s an amazing variety, and it’s all stronger than we’re used to in Britain. You’ll be given a beer menu organised by type and/or region, but the first page will probably list a few draught options (van’t vat), which will be the local mainstays. If you want a refreshing pils after a warm days cycling (and yes, we did drink Stella Artois, though only within a kilometre or so of its brewery in Leuven) it will be cheap, but the more interesting beers cost a bit more, at about €4 for a 33cl bottle. Interestingly, there seems to be no link between alcoholic strength and price. The easiest option tended to be a blond, ie a pale ale but with more strength and character than in Britain (ie they don’t just throw in lots of hops); other choices are amber, red, brown, wheat beers and the famous Belgian fruit beers. Some are abbey or Trappist beers, which should be fuller and smoother, but there’s no guarantee of that. Then there are the real local specialities, lambic and gueuze – lambic is made using only natural windborne yeasts just southwest of Brussels, and it’s remarkably sour, so it may have fruit added, be matured in the barrel for up to three years, or be blended to produce a gueuze. Every beer is served in its own specific marked glass – although the system fell apart on our very last drink together, when Rob’s exotic peach beer came with a bog-standard Chimay glass. Likewise, everything you’ve heard about Brugge being full of tourists and Gent being the undiscovered but more authentic and exciting alternative is true – we were all blown away by the canals and towers of Gent, and by the feeling that it was a real working city rather than just a tourist honey-pot. In the cathedral of St Bavo in Gent the wonderful and very important (in terms of the development of northern European art) altarpiece of the Adoration of the Mystic Lamb by the Van Eyck brothers is being restored panel by panel, but the missing ones have been replaced by photographs that are so good you really wouldn’t know (and the bottom left-hand panel, the Just Judges, is in any case a reproduction, the original having been stolen in 1934). At the Fine Arts Museum you can watch the restoration work through a glass screen – it’s just been announced, having removed layers of paint added in earlier ‘restorations’, that the lamb has a much sterner expression than was thought (in addition a 1951 restoration effort had left it looking as if it had four ears). In June 2020 a new visitor centre will open to show it off properly. Various big museum projects will be coming to fruition in 2019, it seems. In Brugge the Gruuthusemuseum is closed for renovation until May 2019 and in Antwerp the Fine Arts Museum is closed while they build new galleries in the central courtyard – it looks as if it’ll reopen in 2019, but until then many of their treasures are visible in other venues across the city. In Leuven the Treasury in the chancel of St Peter’s church, famous for its two paintings by Dietric Bouts and a copy of Roger van der Weyden’s Descent from the Cross, is closed until September 2019 – but the treasures are on view in the chapels off the nave. In addition, the Caermersklooster or former Carmelite monastery in Gent will open in January 2019 as the Kunsthal Gent, run by local art groups. On the other hand, a new city museum opened in 2018 in Mechelen, in the Hof van Busleyden, once home of Hiëronymus van Busleyden, a friend of Erasmus. It tells the town’s history from the Burgundian period, when it was pretty much the capital of northern Europe, to the present day, and also displays art and shows how the law was applied to art between the fifteenth and seventeenth centuries. On the cycling front, the Wielermuseum or Cycling Museum in Roeselar has just reopened, after a three-year closure, as Koers, which means Race – not really what we do, but still it might be interesting.